Originally from Wyoming. If you're unfamiliar, suffice it to say that basically makes Kyle Kulseth the stuff of legend...like the Chupacabra or Skunk Ape. He’s been living and doing comedy in Western Montana for a couple years too, so...the plot thickens. Alright, enough foreplay. Brass tacks. Kyle started doing stand-up in 2013 to try something new and he just sorta never stopped. Now he spends his weekends and nights telling jokes & stories at drunk people in bars. So much for expanding your horizons, eh...? He’s played lots of places in Missoula, and all over the state. He even toured around the West & the Northwest the last couple springs and likes to get out on the road for comedy when he can. So, Kyle. What makes you stand out from other standups? Without any doubt, it is my keen fashion sense. Ok Ok. Stylin' and profilin. Along that vein, you've been privy to a bunch of music styles correct? Didn’t you play in a band at one time? Why does this feel like a trap? And how did you know I played in a ska band as a teen? Who sent you?! Kyle, you gon learn I find out what I wanna. What instrument did you love the most growing up? I dunno! Probably drums or something. Quintessential. But ok. Enough of the bands. 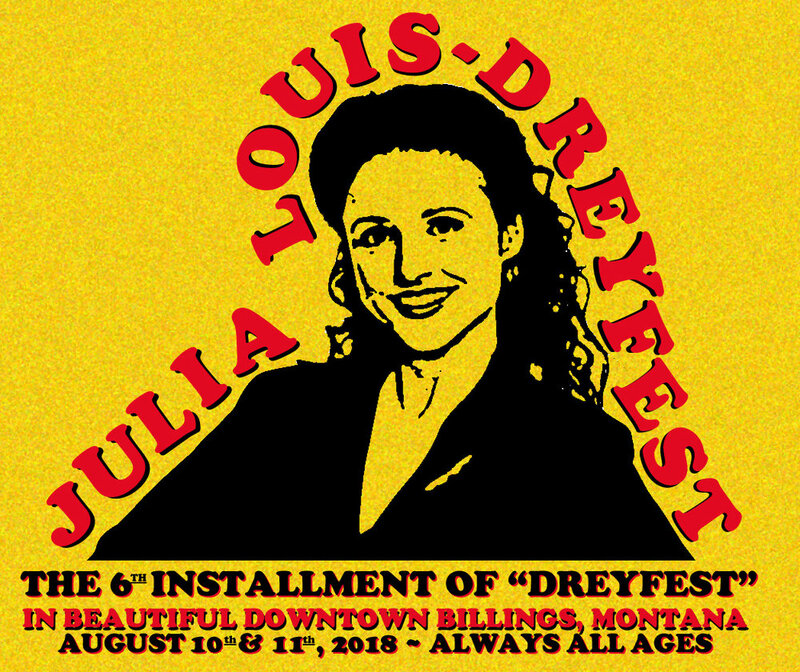 You've done a Dreyfest before right? How do you like this festival compared to others? I love that Dreyfest is doing both comedy and bands. I think those two things kinda belong together anyway. It's always good to drink beers and eat dope Mexican food with good friends for a day or two as well! I agree. Tacos and tequila go hand in hand on those scorchers! So about those funnies? How long have you been tickling ribs? About 4 1/2 years? 5 in October I guess. Time gets a little fuzzy when you try your trade in Montana dive bars long enough. I concur with that. Oooh, here's a good one. What was the worst dive bar you've been into? Might as well ask me which blade of grass is my favorite in a whole sun drenched meadow. Honestly though? The Haufbrau in Bozeman is a favorite, as is Katie O'Keefe's in Missoula if you’re flexible with your definition of a dive bar. I'm not all that up on Billings dive bars, sadly. Maybe that can change this year. Maybe so. There’s a few I’m sure you'd love. The readers may want to know some local hangouts to hit up if they're in some parts of Montana! I guess I should ask you some questions about yourself. Where would you go if money were no object? If $$ were no thing, I would go to Iceland probably. Maybe Thailand. Iceland or Thailand. Both unique locals. Humor me. Why is Iceland without Ice and Greenland without green? TruFax: it was basically a sales pitch by Leif Erickson. He wanted Greenland (actually the icier of the two) to sound better so more colonists would move there. It was all a grift. I see. You seem to have an immaculate knowledge of the doing of land sales. Anything I should be on the lookout for? Something tells me, if things keep going the way they are, property values are gonna start PLUMMETING, like, EVERYWHERE, sooo...ya buyin' or sellin'? Haha. I may be selling. I'll keep you in mind. Anything you want to tell the readers on what to expect from this year’s Comedy Shebang at Dreyfest? Expect to feel GREAT about yourselves....ya know...for attending the show. Hey, couldn't have said it any better! Thank you Kyle, and we'll see you on Aug 11th at Dreyfest!